The other day while I was cleaning out my pantry, I came across a pack of glass noodles that had been lying around for months and thought it would be a great idea to finally use them. Well apparently they require only a few seconds of cooking time. So here I am, in my kitchen, with a bowl of glass noodles on my counter top and trying to think what I should make with them. Well, that’s when I came up with this exquisite looking glass noodle salad. 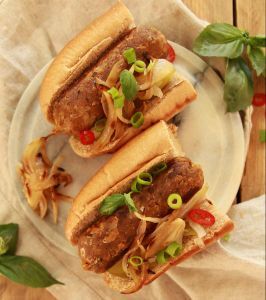 After a brief look in my fridge, I knew I wanted the salad to be packed with green goodness! So, I chopped a generous handful of coriander, rocket leaves, and green onions. But what’s a dish without any garlic? So, I crushed some garlic, along with a satisfying amount of peanuts then added some freshly squeezed lemon juice, olive oil, sea salt and pepper, and before I knew it my lunch was ready! 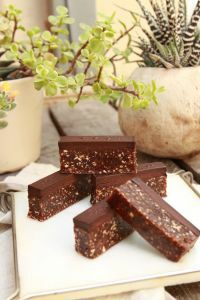 So easy to make, looks exceptionally pleasing, and tastes insanely delicious! Bring a pot of water to a boil, add the noodles, and cook for 5 – 10 seconds until they’re soft, then drain and rinse them under cold water. Next, wash and finely chop the coriander, rocket and green onions and set aside. Roughly chop the peanuts and crush the garlic cloves. 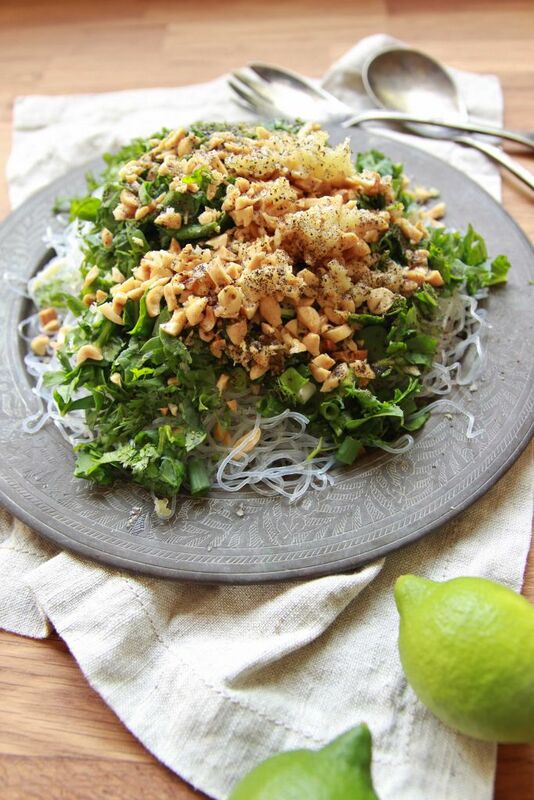 Place the noodles into a serving bowl then add the chopped greens, peanuts, and garlic. 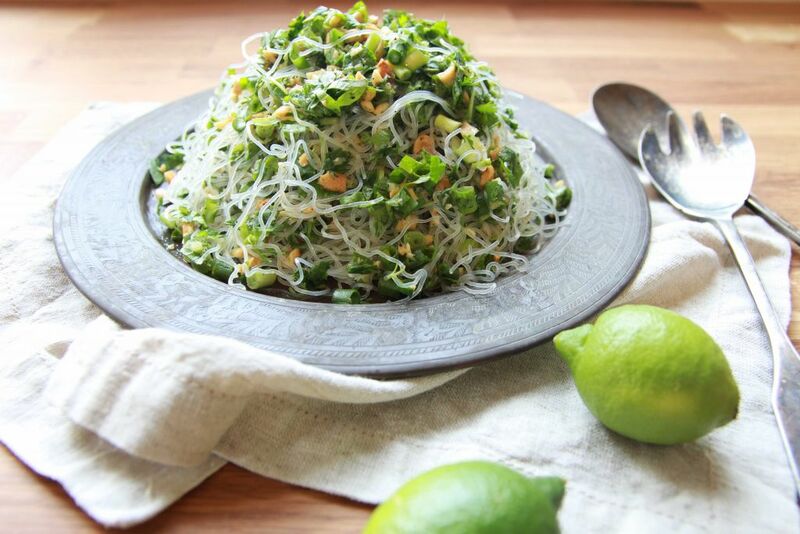 Add the olive oil, lemon juice, sea salt and black pepper to taste and mix well, adjusting the dressing seasoning if needed and your glass noodle salad is ready to devour! 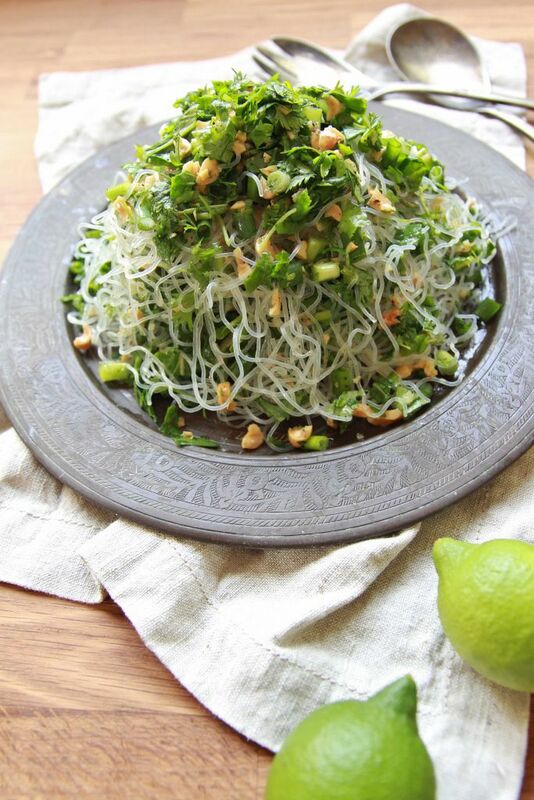 Best served fresh, but the glass noodles can be prepared ahead of time and stored in the fridge for a few days before adding the greens and dressing. 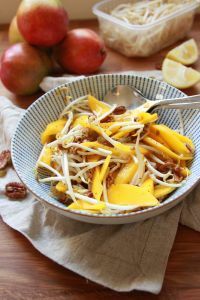 ← Incredibly Refreshing Mango Salad In Just 5 Minutes!